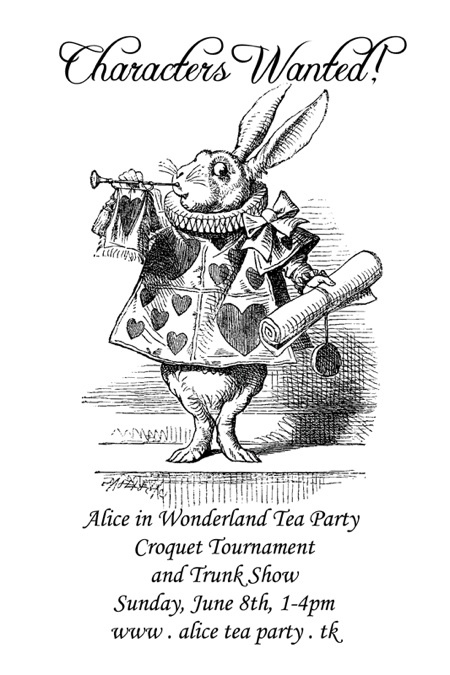 The Alice in Wonderland Tea Party, Croquet Tournament and Trunk Show takes place this Sunday, June 8th at the San Francisco Croquet Lawns at Stern Grove. Visit Eternal Springs Productions for more info and tickets can be purchased in advance. Come in costume, play croquet with the Queen of Hearts and the Cheshire Cat, hang out with the Mad Hatter, enjoy the summer breeze and the beautiful creations of our best local designers and artists. You can even pick your favorite designer and ask them to create a costume just for you! Don’t worry if you don’t know how to play croquet – we’ll teach you!